VirtualDrive Pro is a very useful CD/DVD/BDemulation utility that will come in handy. VirtualDrive has a unique burning capability that allows you tocopy your CD/DVD/Blu-ray discs, games, and other programs tophysical discs and Virtual CDs. Our software allows you to convert original discs into a Virtual CD(VCD), which plays in any one of up to 23 VCD drives. VirtualDrivePro provides a quick and responsive playback without leaving anywear or tear on your disc drive. Furthermore,VirtualDrive Pro enables you to run games andapplications at 200X without the physical disc loaded in a CD/DVDand BD drive. – VirtualDrive Pro reads Blu-Ray discs, CD-ROM discs, audio CDs,mixed-mode CDs, photo CDs, video CDs (DVD-ROMs data-mode), andunencrypted video DVDs, and offers the same game and disc supportas VirtualDrive 14. – Get the latest product features, patches, fixes, and gamesupport. It’s free in all current versions of VirtualDrive Pro! – Run games and applications as VCDs with access rates more than200 times faster than physical discs. Plus, there’s no spin-updelay! – Organize your virtual CDs in a searchable library. 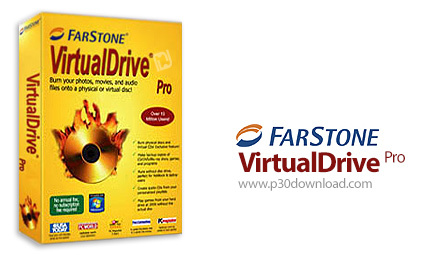 – VirtualDrive Pro’s brand new, user-friendly interface gets you upand running in no time! – Protect your CDs/DVDs/BDs from loss, theft, and damage by usinghigh-quality disc images (VCDs) instead. – Pre-load up to 23 virtual discs and toggle back and forth betweengames or virtual CD volumes without having to wait for physicaldiscs to spin up. – Transport your virtual CDs on a laptop, an external hard drive,and other common digital storage media. – Make a virtual CD file containing applications, documentation,expansion packs, etc. and share it over a network. – Burn data, music, and game CDs and DVDs directly fromVirtualDrive, and make backup copies of your favorite gamediscs.